The Oaks at MidTown is different. The ultimate “Green Project” from the beginning, we’ve completely re-cycled this property into an amazing place to live. We knew from the first visit in 2010 that this site had everything a great home needs – superior in-town location in a quiet neighborhood surrounded by mature forest. BUT, it needed a lot of love: the buildings were worn, the outsides dated, the insides…em…were wrecked. Still, what we love about Chattanooga is that you can take “old” and make it new again. So we set out to improve every aspect of this property: from design, to decoration, to performance, to safety, to features. We want to attract the best tenants, and to do so in an environmentally responsible manner. Which brings us to the whole “Green” thing. No, we didn’t over-pay someone to give us a certificate to hang on our wall. But we did do…..
A complete renovation with an eye on preserving as much as allowed by code. Metal halide & CFL lighting in public spaces controlled by motion or daylight sensors. Kinda cool. Tankless water heaters that are among the best on the market at saving energy and water. A building envelope (walls, windows & doors) that exceeds today’s energy standards. Enhanced drywall, insulation and flooring systems to keep sound transmission to a minimum. Many appliances and fixtures that are Energy Star or Water Sense certified. 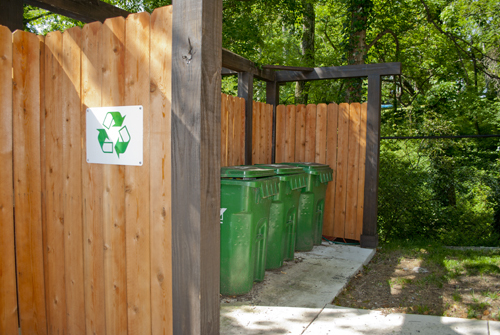 A recycling station for our tenant’s usable waste. We make it easy to be earth-friendly. We’re proud of The Oaks and hope you will call or email to schedule a visit.